Well, what is the Good? How can you tell good from bad? How does your community makes decisions on right from wrong? How do you? Our culture has become so overwhelmingly individualist that we inevitably end up worshiping the Self. The sociologist Christian Smith’s work on Moralistic Therapeutic Deism has shown how historical Christianity has been revolutionized from within by modernity, and has become pseudo-Christian. To oversimplify, modern forms of Christianity do not challenge modernity’s assumptions, and are therefore highly susceptible to being colonized by it. This, in fact, is what has happened to most churches, and most individual believers. As MacIntyre would put it, the lack of awareness of this fact is part of our problem. Yes. There is a Catholic agrarian community around Our Lady of Clear Creek Abbey in eastern Oklahoma. The lay community gathered around St. John Orthodox cathedral in Eagle River, Alaska, is another. 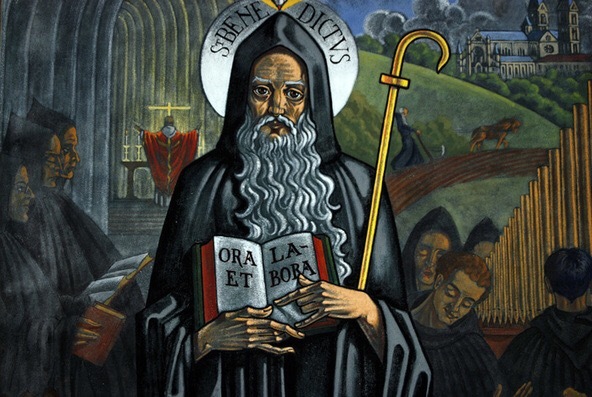 Trinity Presbyterian Church in Charlottesville, Virginia, is working towards incorporating a version of the Rule of St. Benedict within its congregational life. Rutba House, a New Monastic community in Durham, North Carolina, and its School for Conversion, is still another. I recently met a couple in Waco, Texas — Baylor philosophy professor Scott Moore and his wife Andrea — who bought a property near Crawford, Texas, and who are rehabilitating it into a family home and a Christian retreat called Benedict Farm. There is the Bruderhof. I think schools can be a form of the Benedict Option. Consider St. Jerome’s, a classical school in the Catholic tradition, in Hyattsville, Maryland, or the Scuola G.K. Chesterton in San Benedetto del Tronto, Italy, which is run by Catholics for Catholic children, following the vision of the late Stratford Caldecott (see his essay, “A Question of Purpose”). Homeschool groups can be motivated by the Ben Op.